and scarlott really ought to be moving in. bella's news article went round.. last i heard it was in ohio-- nice article-- now if we could just figure out what george has against staying in the cafeteria for lunch..... he is doing exactly what peggity did about going into a ladies room-- she bolted out the door several timea a nd quickly lay down ... clearly telling her owner "i'll just wait out here" so finally that is what her owner did... they came to an agreement. there is something about a sample sticker glued to the middle-- that would never stop us from using them... apparently the stack is about 48" high- covering the back half of the container..
i am pleased that it is sooooo cold-- because if there are any creepy crawlies, i think they die by freezing-- at least i am told bed bugs do..
and latex can't be frozen-- so i don't know where to keep a pallet of paint until we can use it..
now about the gloves situation -- i don't think i went into this before..
when this last snow started--- i knew i had golves somewhere- but i had none when i needed to plow..
so i took a pair that were lying on theresas desk-- a blue fluffy pair-- and left them in the tractor behind the seat... so as long as i was driving the tractor, i had gloves... the rest of teh time.. no one had gloves-- and i kept saying "there should be a box of hats and gloves by the front door so people could grab some..."
finally-- someone said " there is a box by the front door" ..... outside..
so my "order".. last summer about "put theses in a box by the front door" was heeded... but the true3 message was not conveyed... this concept is a huge probl;em around here..
we so carefully teach the dogs to "wait" and "think" with the can of dog food and the spoon... how do you do it with people??? camera shot on puppy hill got moved to 1:30-- which fits. Things are going very well with Kiara. It took her a few days to really feel at ease around the house, but her p & v personality is back with a vengeance. She and the other two dogs are getting along well, although when they really get playing, things go much better when they are in pairs, so we do twosies outside for the most part. The stairs were to intimidating on day one, but with the help of a spoon and a can of dog food, she was able to make her way to the top on day two. We still have challenges with loading up in the back of the jeep, and getting her to stay in her bed (and out of mine) for the night. We are going to get a new bed today, in the hopes that she will find it more appealing. As I had mentioned earlier, I have to travel to DC next week, so she will be at the farm. She and I will be in for my Saturday morning shift, and then back on Sunday for the volunteer meeting. I'll leave her there Sunday, since my flight is early on Monday. I don't get back until Friday night, so I will just plan to pick her up when I am there Saturday. I do have another business trip in March, the week of the 17th. I'll update you with times when I have it nailed down. Thanks so much for letting us bring her home! The whole family is really enjoying her, although I do get the "Have you totally lost your mind?" look from the other dogs once in awhile. I have been posting a few pictures on Facebook, so that her many fans can keep up with her. I hope that someone is able to post them on Discus for the CPs that don't Facebook. I attached a couple of picts here as well. Thanks again, and we'll see you Saturday. I hope you are staying warm by the fireplace this winter. Bob and I will never forget our Lock down experience with you all... Reflection..
As much snow as you have gotten this year you had ice last year. Our first day out together... Megan comes to the cabin door and said " are you ready its a little icy". "No problem I stated." We go down the steps very carefully then all of the sudden I slip and fall to have Megan standing there clapping saying oh this is good! I looked at her confused she proceeds to say this is why we have Khaki. ( to my self I'm thinking but I don't want him to hurt himself.). I'm trying to get up and Megan starts to slide trying to help me. By this time we are both laughing so hard. Mean while Khaki is standing there looking at us both, I could only imagine what he was thinking. Megan then said this isn't going to work I have an idea. She slides to her van and gathers comforters to throw on the walk way and driveway so we can have some grip. That worked great! (So to answer someones question about the comforters... YES! They can be used for a lot of things.) Sitting here writing this I'm laughing because right when we where getting into the van I see you getting into the golf cart I just happened to be looking at Megan while she saying OOOO NOo..... She yells BE-CAREFUL towards you... its icy! you fire up your golf cart and go behind the back of your house to go down the hill that is not the "steepest." As I looked at Megan I said (not knowing you very well) she does know to pump the brakes right? Megan looks over to me and said what brakes! All of the sudden we hear...Wahoo! Its you sliding sideways down the driveway with 4 pink curlers on top of your head! The cart comes to a stop and without skipping a beat you said well that was exciting! I need to go check on the barn, we need sand... on my list to do! My heart continues to fill with warmth, laughter, and love when I look into the eyes of my greatest supporter for the reflection I see in him is...SDP. a towel she could cover it up which always helps immensely. gives you a chance to get out the cardboards. hey-- this is supplsed to be an educational episode. probably needs some sleep.. but i /we need to get on the container problem. 7 pallets-- is a whole new ballgame-- they will fit in a 20 foot cantAINEWR but i had considered a 40 foot. we can afford... that is where sheila comes in... she knows the owner "don"
and the pallet of cans will have to go in the heated barn area for the moment so the cans don't freeze??? luckily the tractor can handle pallets. today -- a meeting about the 2016 calendar.... i remember last year at this time -- thinking we were nuts to start so soon, but we just made it in th elong run... there is alot of details.. and creativity and inspiration does not appear on schedule.. we have some good ideas... someone sent us 4 pages -- some are workable aand we wil talk to william about it... one is comical; " have bentley and walter hold a banner...." and who would mop up all the blood from the fight?? ..to even pull off a photoshop would involve them being closer than practical.. the hatred is great ! the only other large news is pam was up alot last night worrying about footsteps crunching in the snow... whatever it is , it left semi large footprints very close to the house..
like our friendly hawk.... who can no lo9nger "shop" foir varmits in the forest , and is living on about one chicken per day--- --our collection of guinnea hens is down to 2..
making me wonder about ordering chickens -- if you are snowed in and have nothing else to do-- try stromberg's chickens-- great catalog -- it is how you order 25 baby chickens which arrive at your post office-- and if anyone want s to do that and give us the adult birds after you go thru the 90 degrees for baby chicks episode.. we will take them.. we are going to need them-- matt... our friendly animal control officer reminded me hawks are federally protected..wonder if i can get a grant to feed them?? today we must clear out of the house all the opinionated females and get ready for scarlott's arrival ... wanda has got to go somewhere..
we can try kennel 10 with riot... today-- the other option is the back deck-- but htat is not on camera. maybe a crate in the house for when scarlott wants to move around....-- otherwise teh tv room is scarlotts and she must feel secure there. -- and she must have her family come to visit every day as they travel around... stop i n-- quick pat and a cookie... here is a photo ( maybe if it works) we saved money on the ultrasound.... if she is not pregnant she has a huge problem...- and remember an ultrasound has never been correct for the numbers.. paula can play with our ultrasound ( if george says ok). SHE'S DEFINITELY BIGGER THAN LATE LAST WEEK! bulging scarlott ?i t did n't copy???? slow day.. compared to some of the last couple we could use it. i keep saying i will clean this place up in the winter..
it is the kind of problem where i need a herd of scouts to perform the "carlene cleanout"
where i stand and take stuff item by item and hand it to a kid "here this goes in the shop"
and kid #2" this goes in the guest house" kid #3 ... this to the ttent"....ad infinitum..
and leave fill them with stuff that has wandered into the house and needs to "go back there" wherever there is..
in prep i have you tubed " how do they make theose containers"
and there are 2 films on "how to go buy a container"
sheila is enroute to climb around containers in the deep snow along about friday.. last known location she was sliding around in the carolinas with people who had never drivern on ice..
general consensus is that spending a few extra bucks makes sense to get a good one..
i have some feel for that becuase it could end up a big rusting hulk that costs $7000 to get rid of. and there are not many caboose collectors in the whole usa. but the entire camera bunch has become educated viewers..
remember the person who told us we had one stillborn because we were using cell phones in the room. Tim( explore tech) came back with "that is because you did not wash them first"
Wonderful article involving Renee and Sir Thomas !!!! ...i have read up on why the hot water freezes first, and did not understand a word.-i feel very sorry for people who have to work 8 hours in this temp for minimum wage-- i would set congress out in it in a heartbeat...- bet they'd raise the minimum wage then.. i have always known i am dependent on the man who collects our trash-- i feel like today i should run along behind the truck and give him some hot coffee... immagine jumping up on the truck-- holding on with one hand while the truck moves to the next house creating a worse wind chill in the breeze. awful !! what is the big hang up about 180 school days anyway.. time to decide a few computer days would be better... as a matter of fact... didn't some harvard student prepare an entire curriculum on disks?kindergarden thru 12th grade..
i think sheila is driving north - 5 dogs in her RV- eithre starting or arriving tomorrow. that is a worry - when a simple flat tire could be life threatening. who is doing overtime-- big time-- being a nurse , grace sleeps whenever possible for however long- you learn that when you go to med school- i swear my husband could sleep leaning against a wall., and if he had an early plane to catch he would guarentee to be up at 3am without an alarm--it took me years to figure out how he did it...he adjusted his waking by the time and amount of water he drank before going to bed... it worked. did it work?? are we entering a new phase of my tech capabilities-- a photo i the daily doggie??? my tech capabilities are not of my own making... i got 2 text messages yesterday on my phone-- one from megan- sent yesterday and one from earlene saying she was coming to pick up chaos-- and that was 3 days ago. and this is the phone i carefully carry with me when plowing so i can call for help if i get stuck????? BEFORE ARRIVING HOME YESTERDAY WITH CHAOS, WE TOOK HER FOR A 30 MINUTE WALK OUTSIDE OUR LOCAL MALL. WE WERE STOPPED BY TWO PEOPLE IN CARS; ONE ASKED IF HE COULD TAKE HER PICTURE BECAUSE SHE IS SO BEAUTIFUL (OF COURSE, I ALREADY KNEW THAT). THE OTHER CAR WANTED THEIR 3 YEAR OLD SON SEE A DALMATION UP CLOSE. WHEN I TOLD HIM SHE WAS A GREAT DANE, HE SAID HE KNEW THAT BUT DIDN'T WANT TO DISAPPOINT HIS SON WHO LOVES DALMATIONS. WE TOOK HER FOR A GOOD 30 MINUTE TROT AROUND THE MALL AGAIN THIS MORNING. AT THIS TIME, SHE IS VERY CONTENTED SLEEPING ON THE SOFA. "Heard about the tick disease. Very rare here right now but seen in Africa"
the entire concept of "fashionable illnesses and cures" is fodder for the internet . i had an email about jp yousha( a really big respectable dane show breeder) about an eye test to prevent breeding a dog where all the pups go blind. i have no idea why there was then some reference to harl danes from europe. maybe i will find out, but i have had alot of euro danes and blindness has never been an issue.. maybe i will get caught... but there comes a point where if you worry about every known ailment of dogs, you would never own one. which brings to mind--- my husband ( md-- family practice) who used to give out B12 shots to little old ladies monthly--- because it did no harm, he had to do something, and they felt better after the shot. that sentence ----I HAVE HAD --- is a perfect example-- you con't need the HAVE. -- she tells me..
so much going on-- i forgot to get steve's lamb chops for breakfast...-- i am going to get out of here today-- in my car... if no more than to the mail box...maybe even make it round the block. when the tractor was new, i sent the tires off to be filled with something beside air-- at a cost of $750 -- so i never would have a flat tire...it is a simple matter to take the tires off , you just put the bucket down down and then teh backhoe wings down and it is possibel to lift the entiree tractor off the ground and just leave it ( hopefully out of the way- or looking extremely foolish in the middle of the parking area- as was this case.) til you get the tires back again.. i was told it took 2 weeks-- because they had to let the stuff sit to harden- or whatever... well they must have set them vertically, because -they have hardened, but they are not round.--- and if that was not bad enough.. i was unaware that topsfield had managed to have "town water" installed -- as every house we passed had a 2'patch in the hot top which did not quite aproximate the rest of the street. if ypu are counting-- that is 4 "shakes" every 10 feet from the tires and a jolt every 100' over the water main patches. we made it-- with jainine following behind with flashers. we /i could have been arrested- but i was ready in topsfield- because they have my number at the police department as someone who can catch loose animals-- like horses-- last time at 4am about 2 years ago..
everybody has to be good at something-- and after many years with a bunch of 4h kids and their horses... i have had experience at horse catching. so the police called 4am -- they had been chasing a horse for 4 hours only about a mile from my house on rt 97 and tehy were afraid the commuter traffic would start... --it just happened that the trailer was hooked up and only had one sofa in it-- so i slid that onto the groujnd-- grabbed a bucket of grain and ropes and drove to the rescue... the horse came right up to the bucket of grain and teh police were very impressed-- helped me make an illegal u turn with blue lights and i trailered it home. it was a good looking horse-- big time-- i just left it on the trailer figuring when someone got up to feed breakfast tehy would notice.. turns out Bonnie...with whom we have become pals-- had left the horse with extra hay and water so she could be gone overnigth- ( horses will live very nicely on hay and water-- too much grain will kill them )so all the following day i kept calling the police saying " don't forget i have someone's horse" bonnie finally called the police to ask - so i just drove it home for her. Bonnie has become an asset around here-- i think she is a phd and a veternarian- retired-- i don't know where i heard this-- but i theink her claim to fame is taking 500,000 baby chicks into indonesia??? or something like that.at any rate she is an"intellectual veternarian"-- and the one - along with george- who said teh dogs needed tums with all the beef. back to janine's snow- she shoveled her roof while i pushed snow-- then she slid off the roof into a snowbank up to her neck-- and i lifted her out with the tractor... i told her she could drive the tractor home-- she said "i don't know how to drive that tractor" - however by the time she had gone 100 feet she knew all she needed to know to bounce homeward... and i followed in the nice truck. one other fyi bonnie said getting hte phd degree was much more difficult than the dmv degree. interesting. one other fyi----i decided people tend to prefer to be in herds too.. because everytime i passed another front end loader-- we would wave at each other-- like motorcyclists do. sort of a kindred soul out dealing with a massive snow problem. and it is massive.-- and tomorrow it is going to rain. he was not sitting in a nice warm tractor cab ..... in a blizzard... when the decision was made. we are all home safe & sound. Ruckus did great at the rest stop & she travels real well. She is now smelling & investigating her new home. Oh, she just picked out her couch ha ha. Thanks so much for everything & I can't say enough about your awesome staff. ah that the usa would get over the 1 person 1 car syndrome..
and most of the time----that car is cap[able of carrying at least 4 people--the bus and trains in europe were soooo punctual it was spectacular and so easy to use. why do they have such a bad reputation here??? maybe because of the traffic jams caused by all the one person cars?? isn't that a catch 22? it had to be congress' fault i am sure. also bentley's tail..is bleeding again... for all of you who said "oh it is all healed" well it is not... again.. 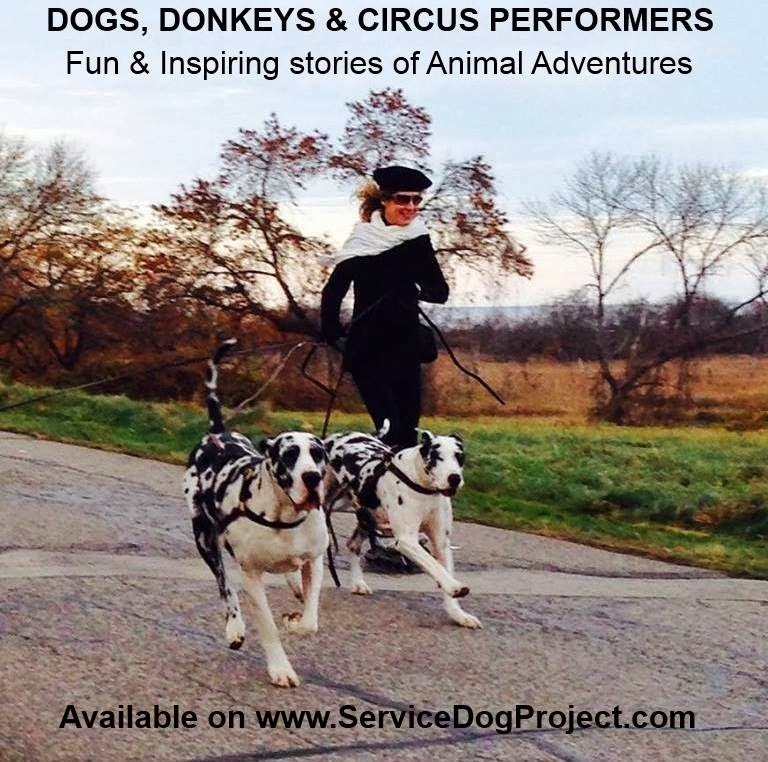 This email is to notify you that Service Dog Project Inc has been issued a $275.58 donation from the AmazonSmile Foundation as a result of AmazonSmile program activity between October 1 and December 31, 2014. LIVELY NIGHT LAST NIGHT---WE..PAM... HAD GROMMET AND HIS 2 SISTERS IN THE HOUSE...WITH ALL THE REST... PAM IS GOOOOOOD. ANY OIL EXPERTS OUT THERE??? CERTAINLY !!!~.. I AM NOT GOING TO MAKE FUN OF SHEILA ( CRANNEY) FOR ESCAPING TO FLORIDA ANY MORE... WELL NOT TOO MUCH.... WELL JUST A LITTLE.. ALONG THOSE LINES I HAVE PUT THE NUTROSYSTEM INCIDENTALS ON THE COUNTER FOR ALL TO "ENJOY" -- GOT TO FINISH THEM UP SO THE NICE LADY ON THE PHONE...DOESN'T GIVE ME H3LL FOR NOT EATING WHAT IS REQUIRED...SO THEY CAN SEND ME MORE. AT LEAST IT IS SOMETHING ON HAND TO EAT WHEN IT WOULD BE A PROBLEM TO GO GET CHINESE FOOD OR A PIZZA..-- LIKE THE MILITARY MRE'S ( MEALS READY TO EAT"). TODAY I WILL BE LOOSING WEIGHT ANYWAY-- TRACY GAVE ME SOME BEAUTIFUL BOOTS TRACI ADAMS SENT THAT DID NOT FIT HER-- THEY FEEL REALLY GOOD... EXCEPT EACH BOOT WEIGHS 47 POUNDS -- SO I WILL GET MY EXERCISE..... IF I MOVE..
todays mental exercise... concerns the door to my bedroom. it is square ( i.e. 4 right angles) so why does the living room light shine thru between it and the door frame?? and the light is not rectangular -- the top definitely has a tendency to be triangular-- a long one, but triangular..
i never noticed it before... could it have anything to do withthe snow on the roof??? this house a boyne falls log home came in 3 tractor trailers with 3 guys who assembled it on the spot. i love the fact i can put nails anyewwhere and change nailholes with no concern... the only bad thing is all the wood was depressing dark brown--- until we put on the tv room with all the windows..
that along with the light switch in the upstairs hall that controls the garbage disposal ( the electrician was a drinker) these things make the place unique..
( actually there are switches up there i have never found out what they control). and i wonder what is holding up the re-accreditation on 3/11//2014 i sent them $1000-- seems like they should be able to respond somehow.... all i have had is "your dogs are wonderful- that is not the problem it is the paperwork...." - well we are not in the business of producing perfect paperwork.. I WAS JUST LOOKING AT THE MOST RECENT PICTURE THAT TINA SHONK POSTED ON SDP EPW FACEBOOK OF THE HARL PUPPY YOU ARE GETTING. SHE'S BEAUTIFUL. HER FOREHEAD HAS THE LOOK OF A LIGHT BURST ALMOST LIKE A FLASHLIGHT BEAM SHINING IN THE MIDST OF HER SPOTS. BE WELL, STAY WARM AND COZY. AS ALWAYS WE APPRECIATE ALL THAT YOU SELFLESSLY DO TO HELP OTHERS. Just checking in to let you know that Pandora is doing great. Buffalo is doing better than your area for inches of snow but it's -26 degrees wind chill. Pandora goes outside, dances around and comes running right back in. Our 13 year old chocolate lab, Mocha, is like a tank and just plows through the 3 feet of snow and cold. Labs are so funny that way. When we let the dogs out they run out the door and have three steps before they are on the ground. Now it's the pattern that Pandora jumps over Mocha LENGTH wise, its amazing. OK for the wonderful work Pandora is doing being a fabulous failure. I will start taking her to the classrooms at the elementary level in March. I have a couple of teachers very interested in helping me get her use to the little ones. She still isn't comfortable with their height and rapid movements. So the one teacher has a small special education class, so that's where we will start. Those children deserve to be the first anyway considering they deal with life so much better than most of us who are not considered "special". Pandora is getting better around other dogs. My son has a lab puppy that has been coming around the last 7 months and playing with Pandora. Now they actually roll around and run together. In the beginning Pandora didn't really know what play was, and she would just sit and watch the puppy. Mocha is just too old to play anymore. My husband Mike thinks Pandora need another fabulous failure to play with her!!!! Pandora is still going to the district office with me almost everyday. My new superintendent is not very friendly toward her so I make sure they don't come in contact very often. He is very tall and a very big man, so of course Pandora grumbled at him the first time they met. Life is funny that way. I have people come in and out of my office all day just to pet Pandora, give her a treat and let her work her magic. They leave relaxed and smiling so she is doing a fantastic job. She also likes to visit nursing homes, and being so tall no one in wheel chairs have to bend down to pet her. I have to admit we haven't been going because of the weather, it's just so cold! We will get back soon. When we picked up Pandora she was about 100 lbs, now she goes 110 lbs and the vet likes that weight. She turns 3 on March 20th and believe or not she is getting a little white on her face. IT IS HARD FOR ME TO REALIZE THE ENTIRE CP POPULATION IS NOT SOCKERED IN WITH SNOW..-- WE CERTAINLY ARE... ALL THESE ROOF COLLAPSES ON THE BOSTON NEWS ARE IN SALISBURY AND NEWBURYPORT--- TOWNS VERY CLOSE TO IPSWICH.. THERE IS NO VOMIT REPORT-- ETHYL SEEMS TO BE KEEPING THE PILLS DOWN.. I THINK WE WILL GET HER TO GEORGES OFR ANOTHER BLOOD TEST TODAY. AND I DID NOT COOK THAT RIB ROAST BEEF YESTERDAY-- THERE WERE NOT ENOUGH OF US HERE TO EAT IT... BUT I HAVE TO COOK IT TODAY. HOW'S THAT FOR AN INCENTIVE...?